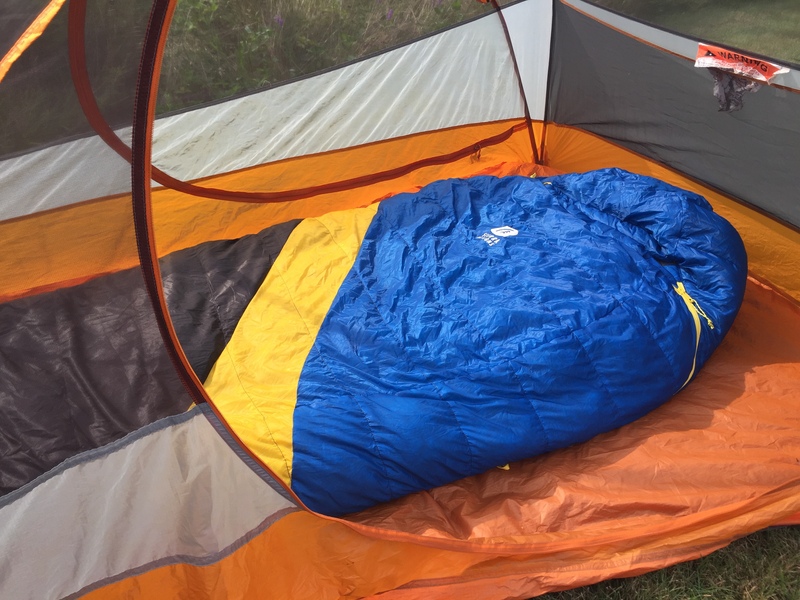 Coming in at a reasonable pricepoint for a weight of less than 1.5 pounds, the Sierra Designs Nitro Dridown 800 Sleeping Bag is rated to 35 degrees, and the Nitro line is available in a variety of temperate ratings and options. The high-loft Dridown fill protects from dampness, and the snag-free zipper works like a dream. For warmer-weather outings, this is a solid option. 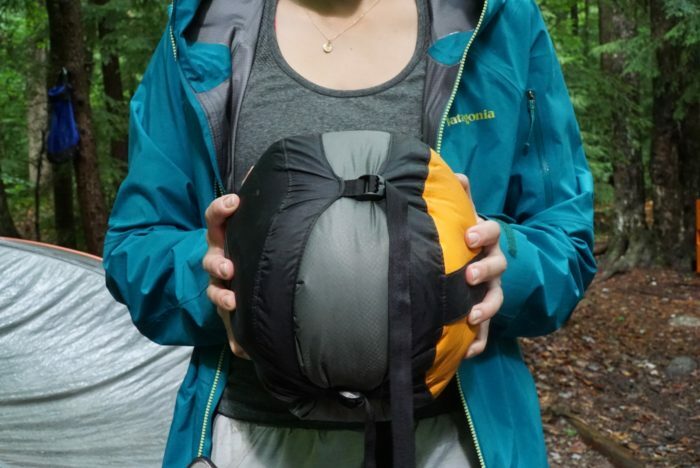 Ever since last summer, when I slept out nearly every night in muggy 70-ish degree weather on the AT with a 15° sleeping bag that was too hot to even lay on top of much of the time, I had been in the market for a lightweight summer bag. So naturally I was beyond stoked when the good folks at The Trek asked if I might like to test out Sierra Designs’ latest contribution to the world of sleep systems: the Nitro 800. The Sierra Designs Nitro Dridown 800 Sleeping Bag is a bag that has clearly been built with long-distance backpacking in mind. It is a Dridown filled, ultralight sleeping bag that compresses down to almost nothing. It comes in three different temperature ratings- 0°, 20°, and 35°. 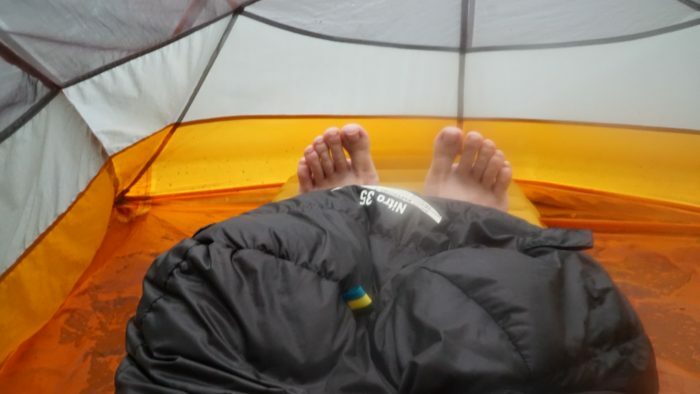 The 35° version that I tested is a great option for thru-hikers looking to shed weight during the summer and sleep a little cooler in warm, humid climates like the AT. I took this sleeping bag on all of my overnight excursions in New Hampshire’s White Mountains this summer. For the most part, we have had hot and muggy weather on the East Coast this year. However, I did manage to spend a night camping in sub-50° temperatures and another with the bag a little damp after getting caught in intermittent thunderstorms. Anti-snag half-length zipper: The anti-snag feature makes it easier to get in and out of the sleeping bag and the shortened length saves weight. Self-sealing foot vent: Compensates for the zipper not reaching the bottom of the bag. Foot vent allows you to easily slip your feet out to stay cooler, but also keeps them warm and snug inside the bag when the temperature drops. 5” Baffle Spacing: Keeps the down from shifting around too much so that warmth is spread evenly. Draft collar: Keeps cold air out of your little oasis of warmth. I found this bag to be great for warm weather temperature regulation. The foot vent definitely came in handy when I needed to cool down. 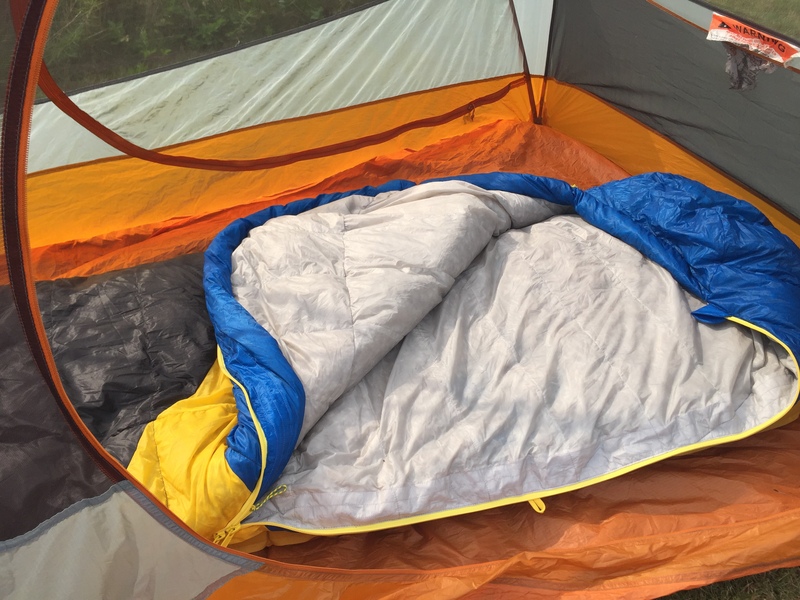 At first I had mixed feelings about the half-length zipper, but came to appreciate that all I had to do when the temperature dropped was pull my feet back inside the sleeping bag, rather than having to reach down and zip the whole thing up from the bottom. It is filled with high-loft down, which is very efficient at trapping body heat and can get uncomfortably hot on especially warm, humid nights. For the most part, this bag makes it easy to stay cool. Put this sleeping bag in a small enough compression sack and you’ll hardly even notice its existence. I used the same 14 liter compression sack that I pack my 15° Big Agnes in and feel that I could have easily compressed it down to an even smaller size had I used a different one. This feature makes the Nitro not only a great weight saver, but a great space saver for your pack as well. The fill inside the Nitro is Dridown, which consists of goose-down feathers treated with hydrophobic chemicals. The Dridown is intended to combat the major drawback of down, which is that it tends to clump together and lose its insulation capability when wet. The fill is encased in 15d nylon fabric which appears to prioritize minimal weight over water resistance. While I did not spend any nights in this sleeping bag while it was soaking wet (thank goodness), the bottom of it did sop up a puddle in my tent one rainy night, making the whole bottom half of the sleeping bag quite damp. It was pretty warm outside, so I wasn’t in much danger of hypothermia should the bag fail to insulate, but fortunately I did not notice any significant difference in temperature between the wet and dry parts of the bag. It was also only the outside of the bag that felt wet, while inside the bag it still felt relatively dry. The major pro of this bag is obviously its very low weight. At 1 lb 6 oz, it is among the lightest 35° sleeping bags available in the $250-$300 price range. Its ability to pack down to an extremely small size is also conducive to weight saving in that allows you to use a pack with less volume. It is roomy and well ventilated, making for a comfortable summer night’s sleep. While comparisons on REI and Backcountry’s websites reveals that the Nitro is priced similarly to other bags with comparable weight and temperature ratings, the lightweight nature of this bag comes with a price that some may find prohibitive. I also personally found the manufacturer’s claimed comfort temperature rating of 37° to be inaccurate. The night I used it in temperatures that hovered in the high 40’s to low 50’s, I slept cold even with a jacket and thermal base layer on. My discomfort was far from extreme (I still slept) but keep in mind that this is definitely a warm weather bag that you will only be able to utilize a few months out of the year in most places. There are less expensive 35° mummy bags on the market, but few weigh anywhere near as little as the Nitro. If you do most of your hiking and camping in warm climates, or your main goal once the temperature rises is to slash ounces from your baseweight, this sleeping bag is worth the investment. 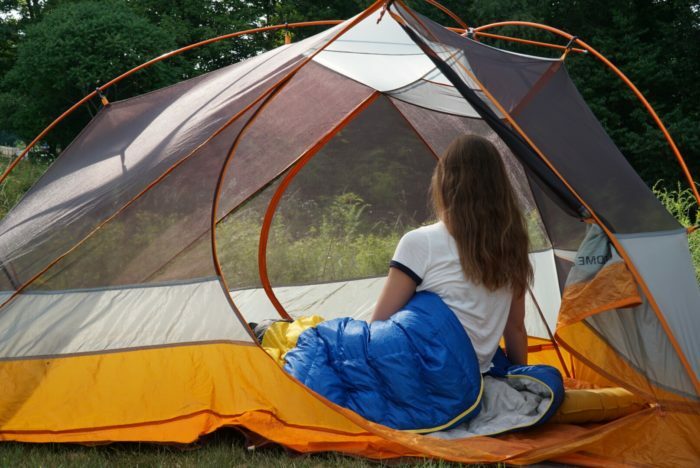 It is comfortable, packable, and ideal for camping in warm weather.